The investigation, "Albanian Telecoms Deal Cost ‘$1m to Buy Off Politicians’, Claim US Businessmen," revealed that a controversial Bosnian businessman, Damir Fazlic, a fixer with powerful friends in Washington and the Balkans, requested $1m in "investment" from US partners for Albania’s Democratic Party in order to secure a lucrative telecoms contract. The investigation formed part of a series of hard-hitting stories on Fazlic reported in the last few months by Marzouk and his team, focusing on the businessman’s ties to the former Albanian Prime Minister, Sali Berisha, and his family. 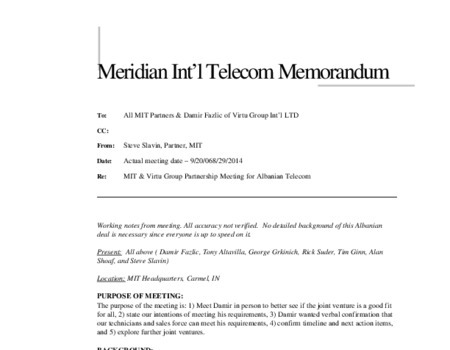 Below, a series of emails show how two American businessmen discovered the the telecoms contract was forged.